It’s official. 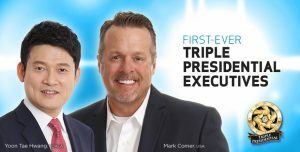 Synergy’s growth has caused two leaders to earn a title that has never been achieved before—Triple Presidential. Congratulations, to Mr. Yun Tae Hwang of Korea and Mr. Mark Comer of the U.S., for being the first to reach this monumental level of success! These men have been with Synergy since the beginning, and they both agree that their time spent with Synergy has been the most rewarding of their careers. This means that Mr. Hwang and Mr. Comer have more than 1.2 million CV on their weak leg volume. This is an unprecedented feat—one that Synergy WorldWide and its founder, Dan Higginson, hoped would one day become a reality. In addition to recognizing Synergy’s first Triple Presidential Executives, 12 additional Team Members hit new executive titles for a total of 14 executive rank advancements in a single month. This is a Synergy WorldWide record! Click the blue button to visit our executive recognition site and learn more about these impressive leaders. The buzz around the world about Synergy’s unified and strategic future is generating excitement like never before, and it’s showing in their business building activity. We look forward to seeing many more Team Members move up the ranks to executive levels in 2016!